There has been a church here since the eighth century. The present structure dates from the 12th century and has been rebuilt several times over the years. It is a combination of Early English and Perpendicular styles. The clerestory, chancel, choir, and north chapel all date from the mid 15th century. The apse is polygonal  very unusual  and is supported from without by buttresses. Some reordering took place in Victorian times, including restoration of the tower and carving of a reredos depicting the Last Supper. There are some table top tombs dating from the 18th century; some of these are broken, allowing one to peep inside if one is so inclined! In 1194 Holy Trinity became a collegiate church. The great reformer John Wycliffe was a canon here from 1362 until his death in 1384. 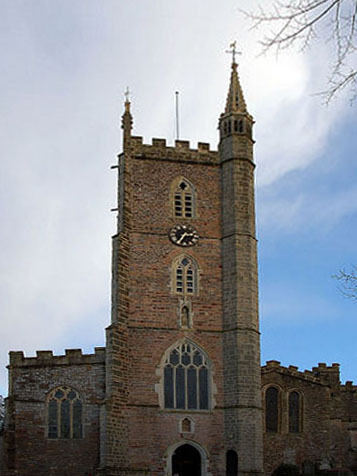 It became a parish church In 1544 with the dissolution of the monasteries. Today the church is in the choral Catholic tradition. There are youth groups, house groups, bell ringers, a Mothers Union, and several other activities all documented on their website. Nearby is the Elsie Briggs House, a 15th century cottage, which Holy Trinity maintains as a sacred space for prayer and meditation, reflection and retreat. In addition to putting on a full calendar of regular activities open to all, the house may be booked by any interested group. There are four Sunday services: two said eucharists, a sung family eucharist, and an evening service (usually sung evensong). Morning prayer, evening prayer, and said eucharist take place on various weekdays. Westbury-on-Trym is a northern suburb of Bristol. It is a lovely village surrounded by 1920s suburbia with the River Trym running through it. The high street is well stocked with shops, pubs, cafés, and restaurants of various ethnic persuasions. There is a very large cemetery nearby dating from 1903. The Revd André Hart, vicar. Nine or so people in a large church. The churchwarden pointed to the choir stalls after saying "Good evening." It was a rather fine Victorian choir stall with lamp. Very quiet; no music and no chatter. The medieval church seemed to radiate time. "Good evening and welcome to this Remembrance Sunday service. We shall be singing hymns a cappella this evening!" 1662 Book of Common Prayer and a modern hymn book. The sound of the singing of the hymns without organ in this large medieval church. That's the way it would have been long before the organ was introduced. Also, the many monuments to past parishioners, mostly in the 18th century, that crowd the walls and floor. All had been important in life, but words fade as do memories of them. It was traditional, using a service that has been heard in this building for centuries. Also traditional Remembrance Day hymns, including "O God Our Help in Ages Past." 8 – The vicar preached a scholarly style sermon for which he used notes. It was about Remembrance Sundays and the effects of wars on lives, both in modern Middle East conflicts and in the past. He talked about the quote "Those who forget the past are condemned to relive it." And as a nice touch he said at the end, "Let us pray for those who died so long ago and remember them and pray that they will rest in peace." The singing without accompaniment  the sound of the human voice singing in a medieval church on a dark evening. The words of the 1662 service "for ever and ever" seemed to radiate around the memories of the day. The lack of people at the service, which seemed to make the medieval church seem bigger. The crucifer and priest walked to the back of the church and we filed out. There was none. However, I had a chat with the priest, who was very friendly. 10 – Holy Trinity has a choral tradition and is well attended in the morning. It has a respect for its history and an intelligent approach to spirituality. I would like it a lot! Yes  and part of a long tradition from centuries past. I was very aware of being in a church full of memorials and just being part of the long story of this place. The sound of the singing on the medieval walls and the words of the 1662 service "for ever and ever."